At Essex Conservatories we not only believe that a new conservatory can create a unique and beautiful space but also a place for work, entertaining family and friends or even relaxation. A conservatory is so versatile and can breathe new life into your home. All of the conservatories we install come with all the high specifications you would expect from a leading conservatory supplier, the windows are double glazed with a 20mm insulating air gap in between the two panes. This means your conservatory will reduce outside noise leaving you with a tranquil and peaceful space inside. Other options for thicker glass can also be provided should you request, this is especially useful if you live on a noisy road. Because we use toughened glass for our conservatories this means that you will be able to use it through all weathers, it can also help to keep your conservatory cooler through the hot summer months. With options of under floor heating and air conditioning units, you really can use your conservatory at any time of the year. Our conservatories are fitted with high quality locks on the windows and doors and have a multi point locking system giving you complete peace of mind that your property is safe and secure at all times. 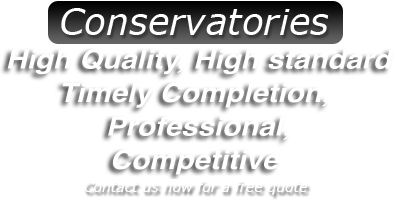 At Essex Conservatories you can be assured that your conservatory will be built to last. From the roof to the foundations and the use of reinforced frames, it will be built to be as strong as the rest of your home. Having a uPVC conservatory means low maintenance! All you need to do to keep them looking clean is to give your frame an occasional wipe over. Timber frame conservatories are of course a little harder to maintain but by occasionally staining them you will bring the wood back to life.